With a free-from menu, we often spend too much time thinking about what we can’t have. We focus on those “traditional” recipes that are laden with dairy or other off limits food. But the list of what we can have is typically so much longer. And, without layers of cheese and cream smothering the rest of the dish, we can let more flavors emerge. This means simple things, including a variety of sauces and condiments, like this berry chutney. Crostini – spread toasted bread rounds with creamy dairy-free “goat cheese” and top with the chutney. Accompaniment – serve it as a side for roasted poultry, pork, or even a vegan Tofurky! Sandwich Condiment – spread whole grain bread with soft “dairy-free” cream cheese (store-bought or homemade) and top it with chutney and sliced turkey, ham, beef, or simply your favorite sandwich veggies. This recipe is dairy-free / non-dairy, egg-free, gluten-free, peanut-free, tree nut-free, soy-free, vegan, vegetarian, and all around allergy-friendly. Just use caution when buying the marmalade and pickled beets; these are typically allergen-free products, but you never know what might be added or if they have some unsavory ingredients. This recipe and image was shared with us by Aunt Nellies. 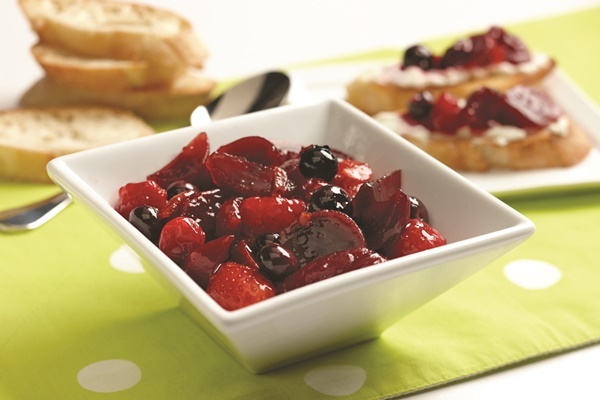 Use one or a combination of fresh or frozen unsweetened cranberries, blueberries, raspberries or strawberries (cut in half or quartered, if large) to customize this berry chutney to your menu and tastes. Place the marmalade in medium saucepan over medium heat. Cook and stir until melted. Stir in the beets and red pepper. Cook, 3 to 5 minutes until the liquid is reduced by about half, stirring frequently. Add ginger, if desired. If using only cranberries, add to pan with beet mixture and cook until they just begin to pop. If using cranberries plus other berries, add other berries to beet-cranberry mixture; stir and heat through. If using only blueberries, raspberries and/or strawberries, add to beet mixture after reducing liquid in first step. Stir and heat through. Remove from heat. Cool to room temperature before serving. YUM. All my favorite flavors and foods in one dish – I love it!